It’s the middle of summer, which is the busy season for vacations and weekends that include outings to the State Fair, local carnivals, and even amusement parks for some family fun. Dentists in SW Portland, OR Dr. Howard Jarvis and Dr. Tiffany Goldwyn and their team at Southwest Portland Dental encourage patients of all ages to avoid these carnival foods in particular while having fun. 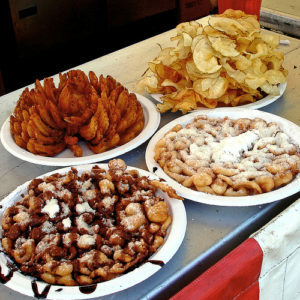 This particularly greasy food comes in a variety of forms in carnivals, fairs and amusement parks. French fries – crinkled, steak cut or shoestring – are usually the side dish of choice, accompanied by a calorie-heavy condiment for dipping like ketchup or ranch dressing. Avoid these fried potatoes by opting for a serving of fresh fruit or vegetables if possible as a new form of carnival food. When they ask if you would like fries with your meal, be ready with a request for cut strawberries or carrot sticks. You can still have some of the ranch dressing for the veggies since the fried potatoes will be off your plate! Not really from elephants, these huge slabs of fried dough covered in butter or sugar are a carnival food named after the size of actual elephant ears. This should be the first clue that this snack isn’t one to eat without sharing with a few people. The carnival food known as elephant ears – and similar fried dough choices – are made from butter, flour, sugar and shortening, which are high in calories and fat that pose all manner of risks to the human body. One of these is a build up of plaque that leads to gum disease if left untreated. Save your smile and the rest of your body through bypassing the fried dough at the fair. Nitrate-filled hot dogs covered in a sugary batter and then deep fried are double trouble. Loaded with calories and saturated fat, these unhealthy sticks of dough-covered meat are carnival foods that are also full of sodium. This can lead to dehydration during those hot summer afternoons and evenings when you’re trying ot have fun at the fair. Not woven to be used as fabric, cotton candy is made of sugar, artificial flavoring, and food coloring. Plus, it’s sticky, which means that the sugar adheres to the surfaces of your teeth until it’s brushed away several hours later. Avoid this danger to your teeth and skip the cotton candy while you’re at the fair. It might seem impossible to avoid these foods while having fun at the State Fair or the carnival. It is, however, essential to take care of your teeth with at least eating these fair foods in moderation and coming in to see SW Portland Dentists Dr. Tiffany Goldwyn and Dr. Howard Jarvis to keep your smile healthy and bright all year long, Call Southwest Portland Dental at 503-244-8112 for your summer appointment!